Located in the southern part of Peru, Colca Canyon has become one of the country’s top adventure destinations. Day trips from Arequipa are the most popular way to see the canyons, and there are hundreds to choose from. 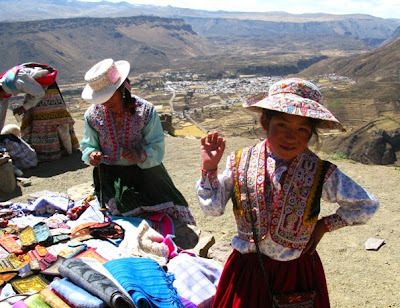 Adventure and trekking tours are a big draw, but we’re headed to the Highlands of Peru to experience local culture, high-quality handicrafts, and spectacular .mountain and canyon scenery. 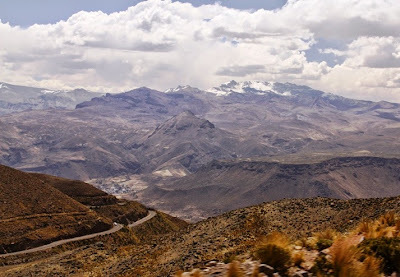 We head towards Chivay, 100 miles from Arequipa, and Colca Canyon beyond that. 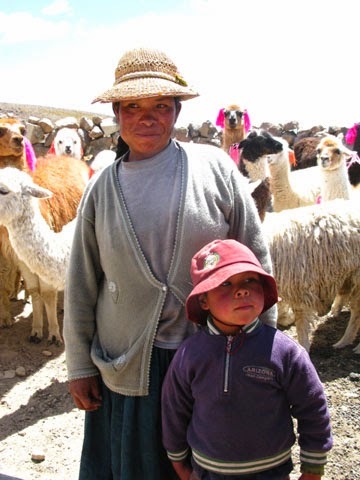 We stop at a small corral with alpacas and llamas sporting colored ribbons in their ears that identify them according to age. We give candy to the young boy who tends the animals with his mother. In this isolated region, some children travel two hours each way to attend school, and tourists are rarely seen. The Trans Oceanic Road that we drive on part of the day was built more than 20 years ago and runs from the Pacific to Atlantic Oceans. The landscape is mostly desert with only a few patches of green where onions and garlic are growing. Mountains in the background are composed of dirt and white volcanic ash that creates a haze drifting the air. Eventually we see more cacti and yellow grass that’s used to make roofs, sandals, rope, and bridges by the indigenous people. and into the mountains of Peru. Franklin, our driver, sets in for a long ride on this paved but desolate road with no place for comfort stops. Vicunas roam in the national park we pass through. These delicate tan and white animals, wild relatives of llamas and alpacas, have wool that is 25 times finer than human hair and much prized for weaving expensive garments. No wonder they are a protected species. Vicunas graze in the shadow of majestic mountains. As we approach higher elevations (now 12,300 feet) Beatrice, our guide, shows us how to roll up coca leaves and place them between teeth and cheek—where it stays for the next couple of hours. Sipping water makes our own coca tea, intended to counter effects of the high elevation (not a cure, by any means!). Locals offer a variety of goods for sale at roadside stops. 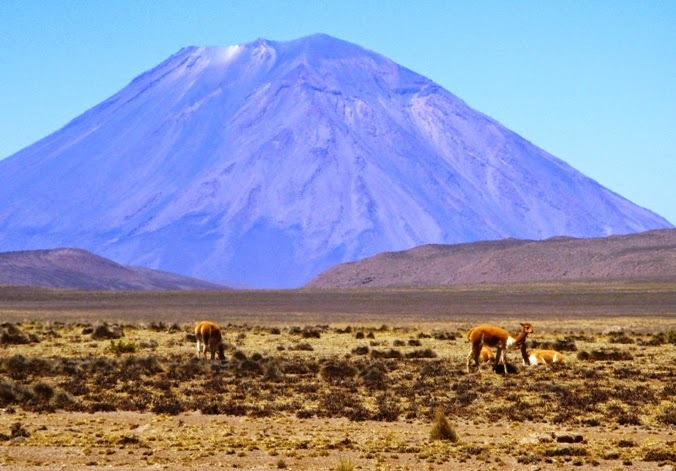 In the distance we see several volcanoes that were visible from Arequipa: Misti, Chachani, and Pichupichu. Mountains, lakes, and prairie landscapes flit by during our long day’s journey into the Highlands. While the terrain seems rather unfriendly, the native people are intrigued by U.S. visitors. This is not a tourist highway, so North Americans are not a common sight, especially at the higher elevations. Along the way we encounter local vendors with handmade goods for purchase spread out on tables. Beautiful textiles and functional clothing items, as well as trinkets and souvenirs, are a modest means of supplementing their meager farming incomes. We stop for lunch and then continue our ascent into the mountains.